Could gene editing spell the end of heart disease, inherited high cholesterol and diabetes? Qiurong Ding , Professor at the Laboratory of Human Genetics and Metabolic Diseases at the Institute for Nutritional Sciences in Shanghai, China, uses stem cells to study new ways of curing life-threatening illnesses. She talked to us about the promise and ethics of gene therapy for our XxXX series of interviews with ten pioneering female scientists. We use stem cells to model human disease, focusing on metabolic diseases such as type 2 diabetes, heart disease, severe obesity and inherited high cholesterol. This allows us to better understand and eventually cure these conditions. We also use gene therapy to treat high cholesterol in mice. Scientists have discovered a gene mutation that allows some people to consume high levels of fat and sugar without it affecting their cholesterol levels or raising the risk of a heart attack. We are trying to find out whether this gene might be introduced into normal people to improve their health. Why is your stem cell model better than conventional animal testing? We needed a model that could mimic what was happening to a human patient. Mice and even monkeys are very different from humans. Some of our genetic mutations can't really be found in animals. Because stem cells proliferate and can turn into many different types of somatic cells, they allow us to study many different diseases and test different drugs. Heart disease and high cholesterol are associated with certain gene mutations. We introduce these gene mutations into human pluripotent stem cells, which are master cells that can produce every other kind of cell in the body, such as neurons or liver cells. The stem cells are either taken from human blastocysts - the term for a very early stage embryo, not yet attached to the wall of the womb - with consent from the donor, or reprogrammed from somatic cells, a different kind of cell which includes blood cells. We can then study these mutations and different ways of treating them outside of the body, for example in petri dishes. You said your second project uses gene therapy to lower the cholesterol levels of mice. How do you do that? We use CRISPR, which is a precise genome editing tool. About ten years ago, scientists found a group of people in Texas who were very healthy despite living on a high-fat, high-sugar diet. They had very low cholesterol, and a low risk of heart attack, even though they ate a lot of hamburgers. This was due to a genetic mutation. The mutation alone gave them a 30-40% lower cholesterol level compared to the rest of the population. The question is whether we can introduce this mutation into normal people. Two years ago, we used the CRISPR material to introduce the mutation into liver cells in mice, via a virus. We also "humanised" the mouse by repopulating its liver with human liver cells, so it was a mouse with a human liver. With this mouse, we are able to test the efficacy of our approach to lower cholesterol in the human liver, but inside a mouse body. Just a single shot of the mutant gene led to a 40% decrease in cholesterol, which was very dramatic and exciting. When might we see this therapy being used in humans? That's hard to say. We still have a long way to go, because we need to think about safety. Genome editing is powerful and permanent - once the genetic information has been changed, that's it. The advantage is that you only need to change it once, it's not like a conventional treatment where you then have to take drugs on a regular basis. But it also means you need to be very careful, because if you change something you didn't want to change, the consequences can be severe. You can't allow any side effects to happen. There have been clinical trials by other scientists using genome editing to fight HIV, so that's very promising. When you cure a disease through gene therapy, do the patient's children inherit the improved genes? No, because we work with somatic cells - liver cells and muscle cells rather than sperm or eggs - meaning the genetic information is not passed on. Some opponents of gene editing and gene therapy believe that it is unethical to modify our genes. How do you feel about that? I'm OK working with somatic cells - liver or muscle cells. We could potentially cure a lot of diseases. I'm more hesitant about sperm and eggs. There's the term "designer babies". For example, I have dark eyes and dark hair, but if I wanted a baby with green eyes, I could edit the genes and achieve that. But I think that would go too far. We have very clear ethical guidelines. In terms of genetically modifying human embryos, if a person has inherited severe genetic defects, if we can crack a mutation and it means the baby will be healthy, that means such research is being used for good. 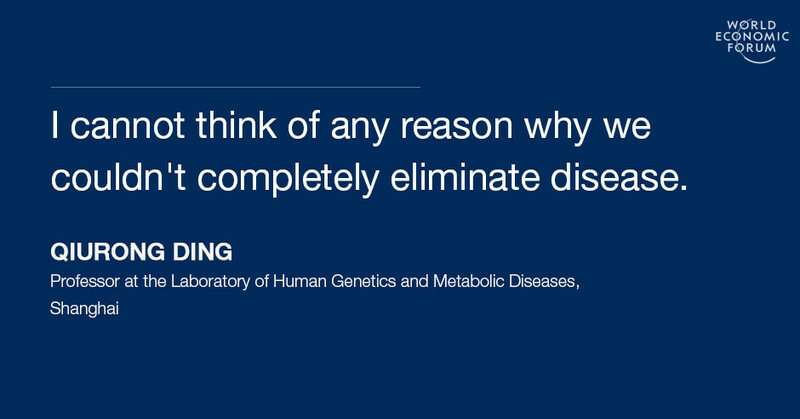 In the future, will we be able to completely eliminate disease? In theory, I think so. I cannot think of any reason why we couldn't do that. Of course some diseases are caused by lifestyle, but those can be prevented. As for genetic diseases, that's the goal we ultimately want to achieve - to eliminate them. As a successful female scientist, what do you think we can do to encourage more women to enter the STEM fields? I'm not sure I'm successful! I'm lucky, I've had very nice advisors, I've learned a lot from them, and I'm in a popular field. There are actually a lot of women in biology, compared to physics, chemistry and maths. In my lab, there are more female than male researchers. We study really fun questions, and we get to work with scientists, patients, mice - it's livelier than just working with equations. That makes it an attractive field.